We can provide you with stylish and beautiful siding and accessories to match. 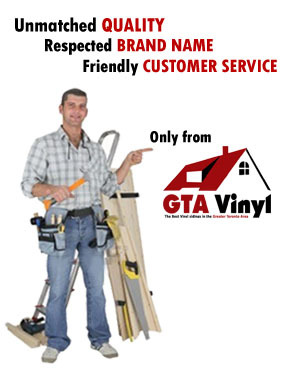 GTA Vinyl’s high efficiency and top quality vinyl siding and accessories are sure to help you bring out the dream in your house without compromising energy, efficiency, and recurring maintenance costs. To view our entire library of products, please contact us here. GTA Vinyl’s high efficiency vinyl siding collection is carefully crafted to bring out unsurpassed strength and energy efficiency. Add an R-value on your home to bear the winter months! Make your dream house a reality with our perfectly crafted vinyl trims. Get your Vinyl or Aluminum Soffit from us to make sure you get low maintenance finishing touches to your dream home.